Way back, even before the Internet, I had a plan; I wanted to collect every single post apocalyptic RPG there was. I got quite a few for my collection before the futility of the project dawned on me. While I don’t aim for getting all of them anymore, I still pick up one every once in a while. Summerland by Greg Saunders has been sitting on my shelf since my last order from Lulu. I wonder if it has what it takes to end up on the gaming table? The book itself is 9×6 180 pages softcover, like most other indie RPGs from Lulu. As I understand it there was a thinner version previously, this one has ‘Revised and expanded’ on the first page. The cover by Paul Bourne is the prettiest I have ever seen on an RPG. Inside there are both photo manipulations by Greg himself and a few pictures by Jerome Huguenin, all very fine but a bit on the darkish side. The text is easy to read and everything is clearly explained, but it still took me a few sittings to get through the game. It is full of examples and flavor text, and I didn’t want to miss a thing. Given how I usually skip ahead when I read games this says something about the quality of the text. The quote below is from the first section of the setting. One night, for no apparent reason, a vast and ancient forest appeared across the land as if it had existed there for hundreds of years. Destructively superimposed on all that existed before it, the forest devastated the works of man. Nothing escaped the blanketing of the trees, not even the tarmac of the roads or the buildings of the city centres. Life as we know it ceased: structures collapsed; roads, rail lines and runways were choked;and anything that may have helped with a swift recovery was lost. for a short while a state of emergency was broadcast over all available media, but soon these reassuring words fell silent. As devastating as the Event was, much worse was to follow. The game starts an unspecified number of years after the Event, as the apocalypse is called. But the PCs grew up before the Event and had it interrupt their adult lives. When the game starts the survivors are spread out in small isolated communities, and the premise is that the PCs are Drifters. The Drifters are immune to the Call, a mysterious force that draws ordinary people into the forest where they disappear, and act as messengers and guides between the settlements. The goal of the game is for the PCs to confront traumas in their past so that they can become whole again and join a community. But as their minds heal they lose the resistance to the Call. Two things strike me as I read the book. The first is that the ‘feel’ of the game is more British TV mini series than Hollywood blockbuster. It is slower, low key and the forest is magical rather than the action movies set in post nuclear war wastelands that we are used to seeing. 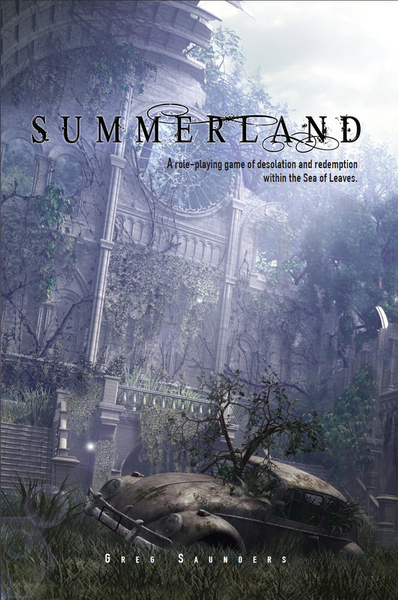 The other thing is that Summerland is an RPG for adults, the setting is very dark in places and psychological issues stand at the very core of the game. The rules are simple. Four stats – Body, Finesse, Mind and Empathy, a few ‘tags’ that are specializations of the stats and two pieces of equipment, and the character is done. At least as far as the mechanics are concerned. Task resolution is simply roll under stat+tag with a number of d6’s (more dice for higher difficulties). A similarly simple system for conflict resolution, that also is used for social conflicts, and a mechanism to track how the character heals the trauma from his or her past, makes for the rest of the body of rules. Summerland is played in the traditional way with GM and players. The focus is not to amass guns and equipment, as is common in the genre, but the healing of the characters’ psychological traumas. Which makes it a bit different. There are lots of advice on how to run the game in the book, and lots of events and encounters around which adventures can be built. Without having played the game I think that it is very well suited for a mini campaign, in a single session the characters will not progress enough towards joining a society to make things interesting and in a long campaign the lack of depth in the rules could become an issue. The setting is excellent. Everyone knows what a forest looks like, and most are familiar with the post apocalyptic theme from movies and other media. The rules are good. Not much depth but they will do the job they were designed for very well. The form is very good. The GM gets lots of advice on how to run the game. Provided I find the group to play a short campaign I would play this, although I think I’d prefer to play the game as a player over GM’ing it. Across the pond the Old School Renaissance rages, people are going back to the roots and play D&D and clones the way it was when first released. But as James Edward Raggi IV discovered – Old School is not universal. My own personal OSR would be to go back to Drakar & Demoner and Mutant, but those are BRP derivatives, and frankly speaking not much has happened on the BRP front since the 80s. I still play those games in their new incarnations sometimes. The difference is much smaller if you compare the first edition Mutant with the (recently OOPed) Mutant:Undergångens Arvtagare edition than if you compare first and fourth editions of D&D. When I later got into English language games it was GDW rather than TSR that got my pocket money and we played Twilight 2000 and Mega Traveller, even if we never quite got the hang of the combat rules in either game. A week ago I stumbled across a thread on the TravellerRPG forums. I sent my $15 and yesterday the reprint of the revised first edition Traveller came in the mail. Should I go retro and play a game of the same vintage as myself? The reprint puts the three original booklets into one single book, while retaining the page numbering in each. Characters and Combat, Starships and Worlds and Adventures, at 48 pages each. There is also a 10 page short story by Martin J Dougherty and a 2 page introduction to the history of classic Traveller. There are no pretty pictures in the book, just two diagrams. One showing a grid to track movement in combat and one showing how a spaceship accelerates and deaccelerates during a voyage between two planets. There is a striking lack of examples in the text, some things I had to read several times and I’m still not sure I’ve gotten all the details in the combat rules right. The society is feudal and characters can get noble titles, there are spaceships and they can jump between star systems, there is a society for travelers TAS, there are psionics and an underground movement that teaches them and swords are still considered relevant in combat, alongside with laser rifles. The rules are simple, the basic resolution mechanic is roll 2d6 + modifiers and get 8+ for success. Character generation with a life path mechanic, and PCs can really die during char gen, just like the rumor says. There are elaborate subsystems for world generation, starship design, vector based starship combat using minis, and interplanetary trade. There are three basic ways to play Traveller: solitaire, scenario and campaign. Any of these may be played unsupervised (that is, without a referee; the players themselves administer the rules and manipulate the situation). The excerpt above is taken from the introduction in the first book. Unsupervised play sounds a lot like story gaming to me, play together and invent stuff as you go. But the traditional GM(referee)+players approach is implied in most other sections of the game and we never learn more about the unsupervised play style. There are tables for randomly generating encounters for those that want to play unsupervised though. The game does not really give any firm indications on how it should be played, I think that if the reader is unfamiliar with role playing it would not make much sense at all. There are rules and tables but no real context in which to apply them. A veteran role player finds a rule set for playing the crew on a small starship on trading/scouting/combat adventures in space. The setting is weak, almost nonexistent. The official setting that followed in the expansions and later editions can only be seen in very faint contours. If you want to build your own setting (alone or with your players) the rules are very accommodating, especially if you want a hard sci fi setting in the 60s or 70s style. The rules are ok, simple in places and quite complex in others. The starship combat actually uses vector based movement! Easy to tweak, combat is very lethal as written, I think. The form is weak, not much information is given on how to play the game, other than a vague feeling that you should have starships and some kind of adventures around them. When I started reading I was quite enthusiastic about the prospect of coming back to Traveller again. Now that I have read the book properly I am not so sure. I will never bother with the starship combat system. But the basic mechanic looks fine for a rules light game. Even the ordinary combat rules look fine, but they would be greatly helped by character sheets that present information in a clearer way. My current situation is that I have one game with ok rules but no setting to speak of (Traveller) and one game with a-bit-too-heavy-for-my-tastes rules but awesome setting (Dark Heresy, the Warhammer 40K RPG). Perhaps I should do some conversion work and port the life paths from the latter into the former? www.travellerrpg.com/CotI/Discuss/showthread.php?t=22994 – Forum post with ordering information, and a good cause to go with it.